This activity helps participants learn calming down strategies and brainstorm how to set up and use a “Peace Place”—a special place to go when someone needs to calm himself or herself or is feeling upset or angry. Daniel Goleman, in his seminal 1996 book Emotional Intelligence: Why it matters more than IQ, coined the phrase “emotional hijacking” for the effect of an intense emotion like anger or fear to hijack or inhibit the thinking part of our brain. Knowing how to self-regulate, or interrupt this process, is not only a core emotional competency, it is critical to young people’s ability to access their thinking brain, restrain unwanted behaviors in and out of the classroom, and attend to the learning at hand. The strategies presented here for calming down initiate physiological responses that calm the body and interrupt the “fight, flight or freeze” response that is at the heart of emotional hijacking. Establishing a Peace Place in your classroom gives your students a way to manage their feelings without your direct intervention. It helps them learn to recognize their feelings and empowers them to come up with strategies to calm themselves down. 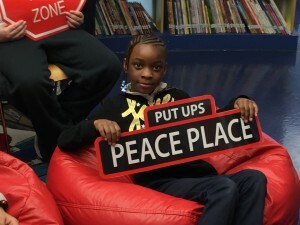 It will take time for your students to learn how to use the Peace Place effectively. work together to set up a place in the classroom where they can modify their behavior and feel better as a result. ELA-Literacy.CCRA.SL.3-Evaluate a speaker’s point of view, reasoning, and use of evidence and rhetoric. ELA-Literacy.CCRA.SL.4 – Present information, findings, and supporting evidence such that listeners can follow the line of reasoning and the organization, development, and style are appropriate to task, purpose, and audience. ELA-Literacy.CCRA.L.6-Acquire and use accurately a range of general academic and domain-specific words and phrases sufficient for reading, writing, speaking, and listening at the college and career readiness level; demonstrate independence in gathering vocabulary knowledge when encountering an unknown term important to comprehension or expression. Materials that will make a Peace Place feel comfortable to a range of students: a rug to demark the area, drawings, photos of nature, flowers, plants, stress balls, picture books, etc. Stand in a circle and ask participants on cue to quickly pantomime feelings. As they do, they should look around at the other participants’ pantomimes. Begin: surprise, happiness, excitement, disappointment, frustration, anger. What did frustration or anger feel like in your body? What did you notice about how others looked when they acted out that feeling? Today we’re going to learn some strategies for calming down and create a way to help us calm down in our classroom when we are having difficult feelings that might get in the way of our learning or productive behaviors. Begin with a quick brainstorm and charting of feelings that children have when they are ready to learn (focused, curious, calm, etc.) and then when they do not feel ready to learn (anxious, angry, scared, etc.). Explain that there are ways to calm down when you’re feeling upset or angry that rely on mechanisms built into our bodies. Deep breathing, stretching, and tensing and releasing our muscles all help to bring calming. Deep Breathing: A fun way to learn deep breathing is to pretend to blow up a balloon. Participants can hold their hands together in front of their mouths. On the count of five (1, 2, 3, 4, 5) they will blow all their air out and expand their hands to simulate an imaginary balloon being blown up. Then for a count of five they will inhale. Hold their breath for a count of two. And then begin again to blow up their imaginary balloons. Encourage students to do this as quietly as they can even though they are taking large breaths. Stretching: Have participants reach towards the sky and extend upwards on their toes, stretching their entire body. Hold this stretch for the count of 5 and then release. Shake your body before stretching again. Tense and Release: While seated, have participants raise their shoulders and clench their fists, holding the tension for a count of five. Now Brainstorm about your Peace Place. Do a go-round in which each participant completes the sentence, “A special place that I find peaceful is. . .” Discuss, if necessary, what a peaceful place is. Begin by sharing your special place. Explain that in today’s activity you will discuss setting up a special place in your classroom, which will be your very own Peace Place. What is the value of having a special, peaceful place? Reflect back and summarize what volunteer students share. Now brainstorm what should be included in the Peace Place. “If the Peace Place is to be a good place to go to calm yourself down when you’re upset, what things will we want to include in that space (stress ball, stuffed animals, pictures of nature, an hour glass timer, etc.)? Where should our Peace Place be? How should we decorate it?” Be sure to keep the discussion focused on how these decisions support the Peace Place being a good place for calming down. Discuss: When and how will we know that it is ok to go to the Peace Place? Going to the Peace Place is voluntary and only for when you truly need it. You have to tell the teacher you are going (this could be an agreed upon non-verbal signal). Set a time limit of perhaps five minutes and use a timer. Explain that someone does not have to be angry, worried, sad, or upset to go to the Peace Place. Sometimes a five minute break at the right time can be helpful in managing one’s feelings or be a time to think about something that is bothering you before reacting. In pairs have the children share: “One thing I’m looking forward to about having a Peace Place is…” Ask for a few volunteers to share what was said in their partner groups. K-1: Follow core instructions for grades 2-5. Create a class journal for students to record their experience of using the Peace Place. This can be available for students to use during a regular journal writing or writers’ workshop time. The journal can be shared at future class meetings or during a read-aloud time. 2-5 Literacy: Read Alexander and the Terrible, Horrible, No-Good, Very Bad Day by Judith Viorst. Ask: “Have you ever had a day like Alexander’s? What did you do? How would having a Peace Place help?” Have students write a letter to Alexander offering him advice for setting up and using his own Peace Place. 2-5 Literacy: Have students write a persuasive letter to their parents, advocating for a family Peace Place in their home. Included in their letter can be the purpose of a Peace Place, suggestions for how it would look in their home, and the benefits to their family of having it. K-5 Integrated Art (Group or individual project): Make Peace Jars. Materials needed: Different-sized soda bottles or food jars with labels removed. Water to fill bottles and jars, vegetable oil, funnels, different colors of glitter, food coloring. Activity: Have students choose an empty bottle or jar and fill it three-fourths full with a combination of water and oil. The more oil used the slower the liquid moves, which can be more effective for calming down. Students add one or two drops of food coloring and a cup or so of glitter. When jars are done and sealed tightly, allow students to practice using their calming down jars. To use the jar for a calming strategy, vigorously shake it. Children then watch the glitter sink to the bottom while breathing deeply. IMPORTANT: Spilled vegetable oil is not easy to clean up. Caution students to be careful -and have clean-up materials handy! K-5 Literacy and Technology: Work with your technology teacher to help students create a “How-To” presentation for setting up a Peace Place. This could be a slide show or video and could be shared with parents, the community, or posted on the web. 6-12: Science Extension: Link this activity to a study of stress and our bodies’ biochemistry during fight, flight, or freeze. Likewise, study the physiology of how calming strategies such as deep breathing, tensing and releasing, meditation, and other ideas interrupt that cycle. Use of biometrics such as mood cards, dots or bracelets can help students experiment with the effect of their emotions on their bodies and the importance of being able to read their own internal signs of stress (tensing of your body, clenching of your jaw, sweating, etc.) as a guidepost that it is time to take a break.